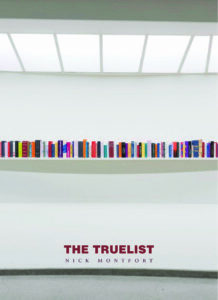 The Truelist is a book-length poem generated by a one-page, stand-alone computer program. Based around compound words, some more conventional, some quite unusual, the poem invites the reader to imagine moving through a strange landscape that seems to arise from the English language itself. The unusual compounds are open to being understood differently by each reader, given that person’s cultural and individual background. The core text that Nick Montfort wrote is the generating computer program. It defines the sets of words that combine, the way some lines are extended with additional language, the stanza form, and the order of these words and the lines in which they appear. The program is included on the last page. Anyone who wishes is free to study it, modify it to see what happens, and make use of it in their own work. Part of the series Using Electricity. 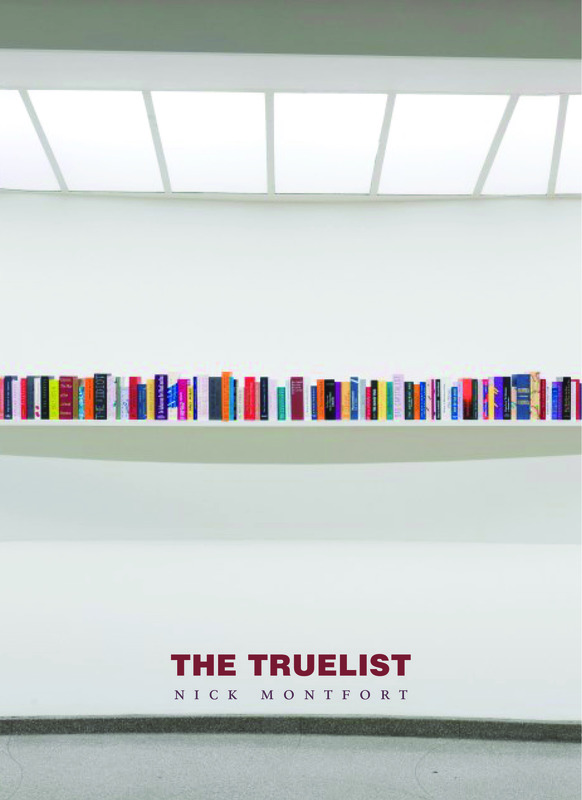 Listen here to Nick Montfort read the entire text of The Truelist. Thanks to PennSound. Nick Montfort is an author or editor of fifteen books, which include books of poetry along with six from the MIT Press, several collaborations, and several artist’s books. Five of his previous books are of computer-generated poetry and include #! (Counterpath, 2014), 2×6 (a multi-lingual collaboration, Les Figues, 2016), and Autopia (Troll Thread, 2016). He is professor of digital media at MIT and lives in New York and Boston.